A few years ago over the 2006 Thanksgiving holiday weekend, Billy Sandifer and I rode down the beach in his old sky blue Suburban searching for fly targets. About 60 miles down, Billy spotted a familiar 4-wheel drive pickup parked on the sand and we stopped to visit. The truck belonged to local angler Charlie Golla. Charlie’s two boys, Chris and Justin, stood near the tailgate wearing neoprene waders and big smiles, ready to take on the surf. Chris was 16 at the time and Justin was 8. Chris had his fly gear out so he and I immediately struck up a conversation, trading ideas on different ways to approach the beach with fly tackle. Chris reported that the jacks had shown up the day before near the 55 mile mark and had been hammering migrating mullet there. His report stoked my enthusiasm. After visiting for a few minutes, Billy and I loaded up and headed out. As I watched the Golla’s shrink away in the rear view mirror I was impressed by how polite and focused Charlie’s boys were. Despite camping on the beach for nearly 5 days they were chipper, bright-eyed, and ready to chase fish… way better off than I would have been after that much time in the sand. I munched on some of Charlie’s fantastic smoked redfish as Billy and I rattled up the shoreline. “Maybe it’s Dad’s cooking that keeps those boys smiling,” I thought. Since that morning, Charlie Golla has kept me posted on the boy’s fly fishing adventures, and he regularly sends me photos and stories of their fly-caught fish. The fish seem to get bigger and bigger each month. 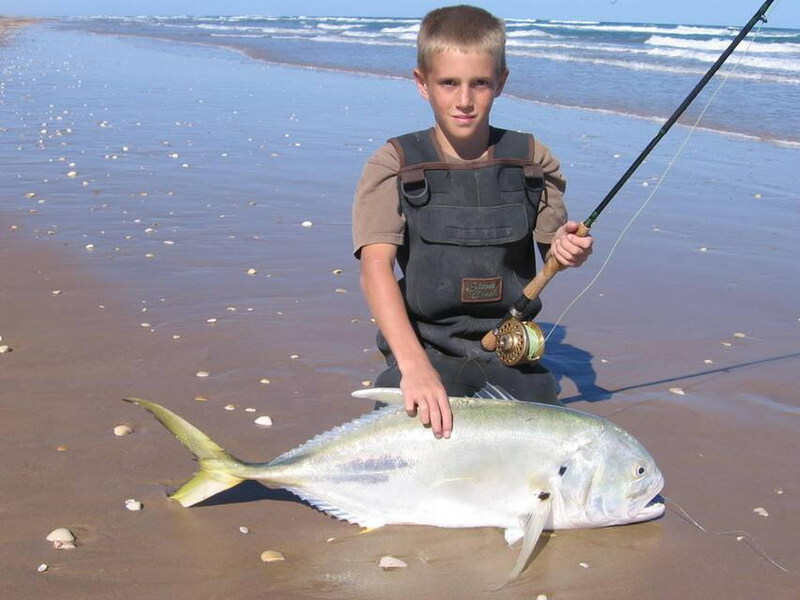 Last year, 9-year old Justin sight-cast and landed a 32” jack crevalle from the beach on his 10 wt. fly rod. 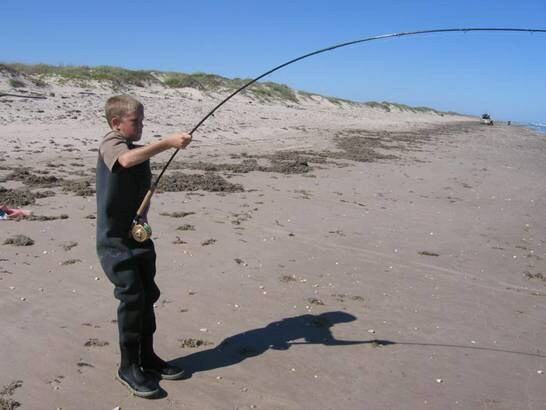 Just think about that for a minute… a 9-year old wielding a 10 wt. 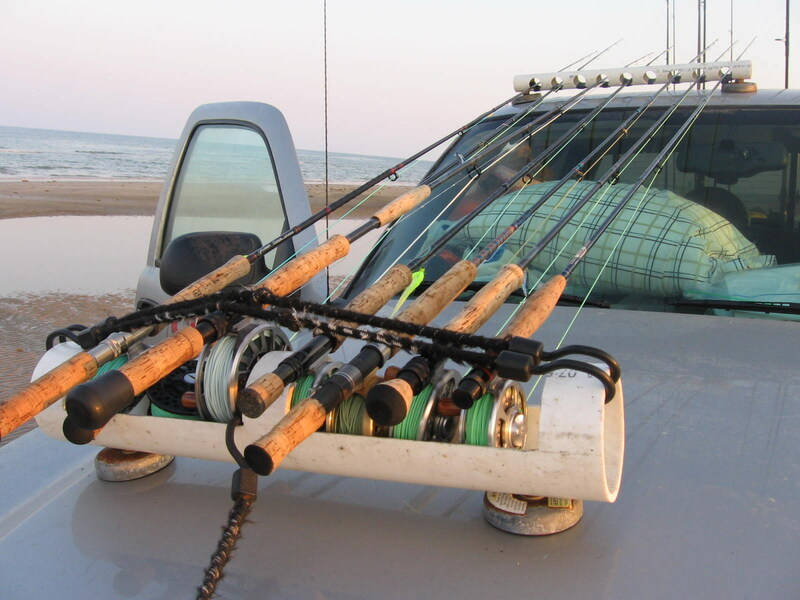 fly rod on the beach and landing a 32” jack with it. 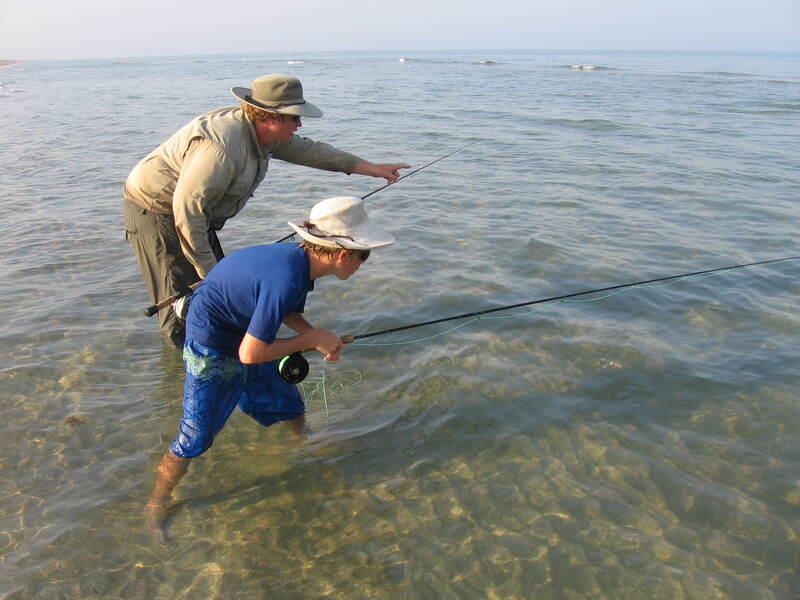 Hooking a big jack on fly tackle and landing it on the sand is physically demanding even for seasoned fishermen. No doubt it’s much tougher for an angler who barely outweighs the fish. In fact, I am tempted to carry a photo of Justin fighting that jackfish so I can flash it the next time I hear a grown man whine about casting in the wind. When Justin and Chris aren’t chasing fish in the surf, the two enjoy kayaking and camping near Aransas Pass with their dad, Charlie. Justin says he enjoys fly fishing from a kayak because, “I like to work for fish.” To date, Justin’s caught flounder, trout, reds, skipjacks, jack crevalle, and a host of other species on fly tackle. Chris picked up his first fly rod 4 years ago. When asked how he got started Chris says, “I used to see Billy Sandifer’s Suburban cruising down the beach with all these fly rods strapped on it. I knew I wanted to try it.” Chris eventually procured a fly rod and began teaching himself to cast. Sandifer supplied him with a few flies and books, and members of the Rockport Fly Fishers provided Chris with some casting instruction. It wasn’t long before he was off and running. Like a lot of anglers, Chris has gone through some fly tackle over the past few years. One of his first outfits vanished during a drive up the beach. Chris replaced it, and then unfortunately it was stolen along with several others. Chris eventually built back up his arsenal of fly tackle and it now consists of fly rods and reels capable of landing everything from ladyfish to tarpon. Chris is also an avid fly tyer. He again credits the members of the Rockport Fly Fishers for helping him with the basics. Some of Chris’ favorite patterns are Clouser minnows, spoonflies, and a large mylar tubing (created by your’s truly) fly called a Christmas Minnow. To date, Chris has landed reds, trout, flounder, snook, and jacks with his fly rod along with nearly every other Texas inshore species. 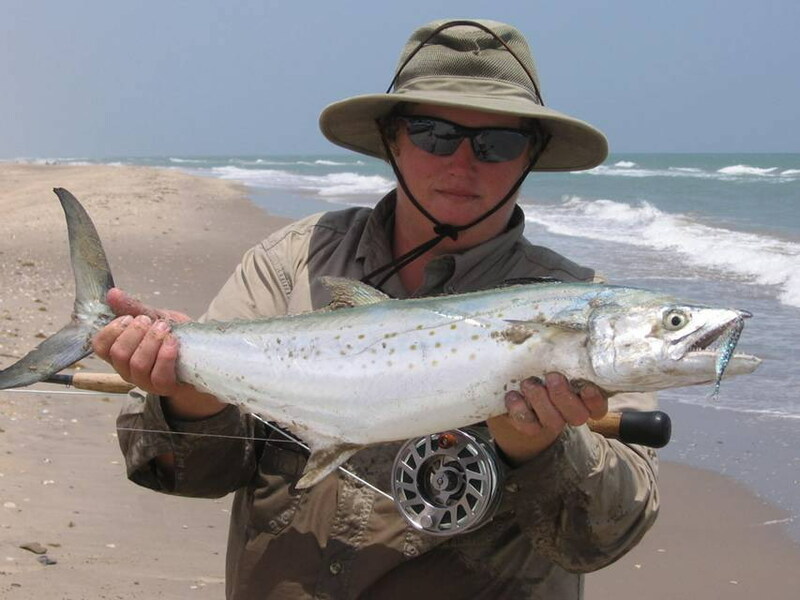 But perhaps his most notable catch was a Spanish mackerel he landed on July 29, 2007 while fly fishing on PINS. Chris says, “We were coming up the beach around the 55 mile mark when we noticed pelicans diving over what looked like black sand. It looked like a place where you might see some fossils so we stopped. Then Dad started hollering for me to grab my fly rod. We could see all these fish so we start casting at them. Dad hooked up and then I cast right out in front of these cruising Spanish mackerel and a big one appeared from behind and just slammed the fly. The fight was on. I eventually landed him on the beach and he looked like he might be a record. We found Billy (Sandifer) farther up the beach and he said he thought it would be the new State Record Spanish Mackerel.” Sure enough, Chris’ fish was certified as the new State Record Spanish Mackerel, Fly Fishing division, at 6.6 lbs and 30.88 inches- quite an achievement. Congratulations to both Chris and Justin Golla for their accomplishments in the outdoors. 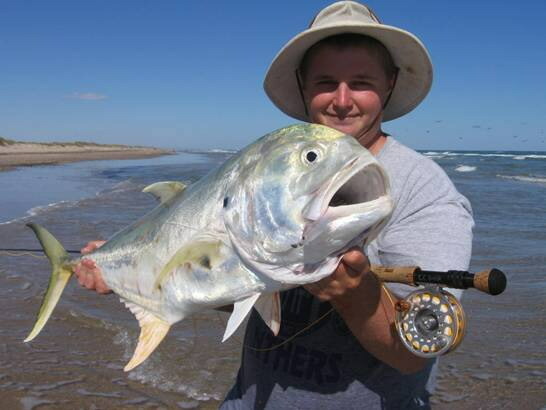 Through hard work and hands-on experience they have proven themselves as talented anglers. No doubt more fish and more adventures lie ahead of these two fine young men.